The gods of Ireland, Scotland and Man are intimately related to the land and the people, as well as being regarded as ancestors of many of the royal dynasties. Given the sources that survive for Ireland in particular, we see a landscape full of gods and goddesses, and understanding this landscape helps us understand some of the basics of belief. The following map and accompanying table gives some details of which deities are most closely associated with which places in Ireland, taken from the myths, Dindshenchas, local lore and placename studies. Where possible, details of the association are given as well. Listings are given alphabetically, according to the deity, but otherwise in no particular order where there is more than one place associated with a particular deity. Given the fact that some areas are particularly concentrated with relevant places and features that need listing, some consideration for space has had to be taken into account. Where each and every spot could not be fitted into the map, the specific place that is associated with the god(s) is given first, and the nearest relevant spot on the map is then given in bold, for point of reference. The map is by no means complete – not least because many associations that can be found in the older lore, especially, can be difficult or now impossible to locate on a modern map (especially wells and plains, or features like the fulacht na Mór-Ríoghna, or lochs like Loch Lugborta, said be named after Lug), since the names may have changed and the old associations been forgotten. It can be seen, however, that many names show a remarkable consistency in terms of the general area they are found in; Cailleach Bheura, Mugain, Donn and Clíodhna cluster in the south; Nuadu to the east; Medb and the Morrígan are concentrated mainly to the west, and Macha is centred firmly around the heart of Armagh to the north. 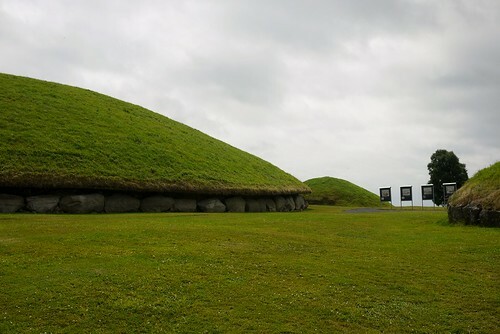 The exceptions to this is with deities like the Dagda, who said to have overseen the building of the brughs/síd mounds in Ireland in Lebor Gabála Érenn,1 or Manannán mac Lir, for example. While it might seem that they get around a lot, it also makes sense that the Dagda would be associated with many different brughs, as the lore bears out, and that Manannán, with his associations with the sea and the Otherworld in particular, would be associated with many different watery contexts, such as the creations or naming of loughs. It should be pointed out that sometimes these ancestral deities might be co-opted by a people for more contemporary, political and largely secular purposes, such as in the case of Áine. 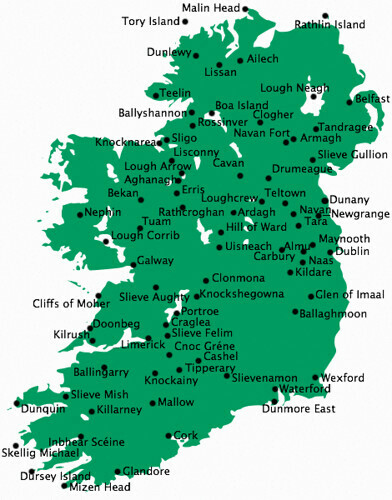 A goddess of the Munster area, she was adopted as an ancestral deity of the Norman Fitzgerald family after they were given lands taken from the Irish chiefs, in order to legitimate their claim and influence in the area (see below). Nonetheless, it seems that Áine was adopted for her already firm associations in the area, rather than her being a contemporary invention of the time. Knockainy, County Limerick Áine From Cnoc Áine, the ‘hill of Áine’ and site of Midsummer fire processions.Although not a major player in the myths contained in the many Irish manuscripts, Áine remains a very prominent figure in the Munster landscape. A wife (or daughter) of Manannán, she has a sometimes fearsome, sometimes benevolent reputation according to the local lore associated with her (see entries, below). Boa Island, County Fermanagh Badb Named after Badb (or Badhbh in modern Irish), and situated near the north shore of Lough Erne.16 A number of ‘Janus-figures’ can be seen there, which may be pre-Christian. Kildare, County Kildare Brigit Saint Brigit is said to have founded the monastery at Kildare, possibly on a pre-Christian cult site of a goddess of the same name. Dunquin, County Kerry Cailleach Bhéarra Here she lived to a fine old age at the top of Cnoc an tSíde, her cabin buffeted by the coastal elements. She subsisted on “real, pure madhbhán”, dulse, fish, and wild garlic, and was known to be incredibly wealthy. Knowing that people knew this, she stole a lobster from a local pot and put it in a box, and the next day a thief broke in to her cabin and searched for her wealth, which he presumed to be gold. Finally, he located a box under her bed – the sort that seemed a likely place to keep a pile of money, and he noticed a hole in it. Thinking the Cailleach too old and stupid to mend it, he reached in to get at the money and had his hand gripped by the lobster instead. There he stayed, trapped with his hand in a box by a lobster, until the Cailleach returned from collecting food. Finding the thief, she complimented the lobster on its good work and killed the thief with an axe.39 Wealthy she was, but not in the way the thief was expecting. Glandore, County Cork Clíodhna Said to have drowned in Glandore bay, at Lecht Clíodhna (the Rock of Clíodhna), where the Wave of Clíodhna swallowed her.43 “Her name is on the roaring wave called boldly after her agony” says the Banshenchas. Mallow (Carraig Chlíona), County Cork Clíodhna Later lore cites Carraig Chlíona, in the parish of Kilshannig, as being her home;47 Clíodhna had a reputation for carrying off eligible young men from a market or fair in the area, if they happened to take her fancy. She also has more benevolent associations, and it is said that she protects the cattle in the area from evil eye and malignant spirits. She is said to protect the harvests from blight, and in Wood-Martin’s day he commented, “the peasantry are the children of her peculiar care.”48 The locals must treat her with respect, however. It is said that once upon a time, people tried cultivating potatoes around the site of her rock, until wailing, “as if lamenting the desecration” was heard.49 Some stories have her as the sister of Aoibheall, and while Aoibheall was gentle and quiet, Clíodhna grew to be a beautiful and outgoing woman, skilled in the druidic arts and able to transform herself into any shape or creature she wanted to. They both fell in love with the same man, but being so quiet and shy nobody knew of Aoibheall’s feelings and it was Clíodhna who ended up being set to marry the athletic young man, Caoimh. It was Aoibheall that Caoimh was secretly in love with however, and soon Clíodhna found out. Wanting Caoimh for herself, she gave her sister a magic potion that made her ill, and then pretended to tend to Aoibheall with further potions that ended up put her into a deep sleep, as if dead. Aoibheall was taken to a cave for burial, and her parents and Caoimh mourned her deeply. However, nobody knew that Clíodhna had gone to the cave after Aoibheall had been laid to rest, and had woken her up. She begged Aoibheall to give up Caoimh, and told her that she would be kept in the cave until she agreed to let Clíodhna have Caoimh to herself. Aoibheall refused, and so Clíodhna transformed her into a white cat, and nobody was any the wiser. Clíodhna and Aoibheall’s grief were so great at the loss of their daughter, that they eventually died of it. Clíodhna and Caoimh were happily married for some years, and had two daughters together. Eventually – inevitably – Caoimh found out what Clíodhna had done, and demanded that she remove the spell over Aoibheall, but she told Caoimh that she could not, and that she had told Aoibheall that he’d been killed in battle. The resulting rift between Caoimh and Clíodhna led to Clíodhna taking their daughters to Carraig Chlíona, where she undertook their education. In spite of their unhappy parting, it is because of their marriage that Clíodhna is associated with the O’ Keefes – Caoimh (pron: ‘keev’). Clíodhna and her daughters still live at Carraig Clíodhna, and it is said to be the place where the daoine sìth from all over the place gather to agree laws and treaties of peace, and resolve any differences through peaceful means. Local folk often see Clíodhna dancing at the top of the rock around the waning of the May moon, and some of the locals join her. Newgrange, County Meath The Dagda, Oengus, Boann, Bodb Derg, and the Morrígan The Dagda’s home was originally Brug na Boinne, but was tricked out of it by Oengus. 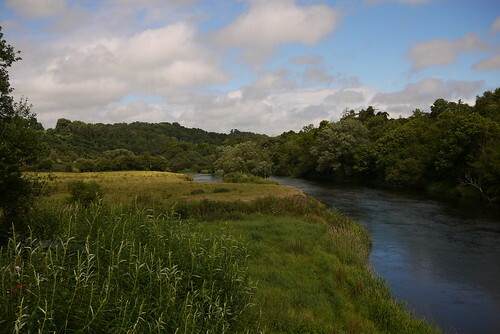 Boann lends her name to the River Boyne in the area, and nearby, local hills are known as the ‘Paps of the Morrígan.’ (See Metrical Dindshenchas 1 and 2). Donn of Cnoc an Uais and Donn of Knockfierna. With Anegus Óg by the smooth Boyne. Defeating Balor the cruel enchanter. As they sailed in before the wind. Tuam, County Galway Finnbheara Cnoc Meadha (Knockmaa) in the area is said to be his home.69 At the top of Cnoc Meadha there is a large burial mound, and the summit gives views across a vast area of the landscape, much of which is also important to the mythological landscape of Ireland. Erris, County Roscommon Flidais Flidais is said to have lived here. Nephin, County Mayo Flidais Another home of Flidais. Dunlewy (Dún Lúiche), County Donegal Lug The site at Mount Errigal and the surrounding area is particularly associated with Lug. Navan fort, County Armagh Macha From Emain Macha. Limerick, County Limerick Manannán mac Lir The Dindshenchas for Limerick (Luimnech) extols the virtues of its soldiers, and the heroes, standing at Tul Toinne (see also: Banba, Portroe) claim: “ ‘Shielded’ (luimnechda) is the stream of Mac Lir: unfruitful are its strong men!” The stream referred to here is presumably the Shannon (named after Sinann, who is named as a granddaughter of Lir), and MacQuarrie makes the point that the ‘shield’ referred to is possibly something like the bronze wall (or ‘brazen cliff’) that Manannán is said to have magically raised in the Dindshenchas for Umall. Tara, County Meath Medb Lethderg, Tea, Nuadu, Lug, Étain A political centre associated with the high kingship of Ireland, Tea is said to have leant her name to it (Temair) in the Dindshenchas and Lebor Gabála Érenn.84 That she is a Milesian is perhaps fitting, given that the place itself is so intertwined with the kingship and the rightful rulership of Ireland. Nonetheless, the gods are also present. Nuadu, Lug, and many other gods and mythological figures, are said to have ruled there, and in the Wooing of Étain, Eochaid lived there with Étain after they married. Brí Léith, Ardagh, County Longford (Slieve Golry) Midir and Étain Midir’s síd in The Wooing of Étain, but named after Bruachbrecc, doomed lover of Liath according to the Metrical Dindshenchas. Aghanagh and Lisconny, County Sligo The Morrígan The Morrígan is said to have had one foot in either place, south and north of the River Unshin respectively, in the episode of Cath Maige Tuired where she met with the Dagda for their tryst (84). Ballaghmoon (Bealach Mughna), County Carlow Mugain (Mór Mumhan) As above. A tricephalic stone head was discovered at the site and is thought to date to around 200BCE. It is popularly associated with Brigid, but there seems to be no basis for this aside from the triple head/triple goddess connection. The head itself appears to bear male faces. In the Dindshenchas of Ailech, it is also where the Dagda’s son, Aed, died, and where the Dagda built his burial cairn (Poems 22-24). Tandragee, County Armagh Nuadu Stone statue popularly said to represent Nuadu Necht. Uisneach, County Westmeath Tuirill Bicereo, Dian Cécht It was also at Uisneach (Cnoc Uachtar Archae) that Tuirill Bicereo (sometimes known as Delbaeth) drank an emetic made for him by Dian Cecht, to rid him of a poison. Upon taking the draught Tuirill burped three times – “a cold belch in Loch Uair, an iron belch in Loch Iairn, and a … belch in Loch Ainnin, and, according to this story, it is thence they [the lakes] take their names.”96 The tale is suggestive of the fact that Tuirill is actually responsible for their creation as well, as vomiting, burping, sweating or crying topographical features into being is a common cosmogonical motif.97 We are told by O’ Hanlon, in his Lives of the Saints that Loch Uair is the ancient name for Lough Owel,98 which is in the vicinity of Uisneach (the middle lake of the three nearby, on the map above). This suggests that Iairn and Aininn correspond with the modern Lough Derravagh and Ennell (north and south of Lough Owel, respectively). 1 Carey, John: Lebar Gabala: Recension I, 1983, p288. 2 See for example, Transmutations of Immortality in ‘The Lament of the Old Woman of Beare’ by John Carney, in Celtica 23. 3 Dooley and Roe, Tales of the Elders of Ireland, 1999, p15. 4 Ó Crualaoich, The Book of the Cailleach, 2003, p39. 5 Joyce, Irish Names of Places, 1869, p183. 6 Rolleston, Celtic Myth and Legend, p 127-128. 7 Lysaght, The Banshee: The Irish Supernatural Death Messenger, 1986, p195. 8 Wood-Martin, Traces of the Elder Faiths of Ireland Volume I, 1902, p356. 9 Ó hÓgaín, The Lore of Ireland: An Encyclopedia of Myth, Legend and Romance, 2006, p8. 10 MacNeill, The Festival of Lughnasa, 1962, p151. 11 Ó hÓgaín, The Lore of Ireland: An Encyclopedia of Myth, Legend and Romance, 2006, p8. 12 Macalister, Lebor Gabála Érenn Book IV, 1941, p155. 13 Stokes, ‘Coir Anmann,’ Irische Texte III, p289. 14 Ó hÓgaín, The Lore of Ireland: An Encyclopedia of Myth, Legend and Romance, 2006, p20. 15 Lysaght, The Banshee: The Irish Supernatural Death Messenger, 1986, p194-195; Logan, The Old Gods: The Facts about Irish Fairies, 1981, p45. 16 Wood-Martin, Traces of the Elder Faiths of Ireland Volume I, 1902, p358. 17 Ó hÓgaín, The Lore of Ireland: An Encyclopedia of Myth, Legend and Romance, 2006, p28-30. 18 Joyce, Irish Names of Places, 1869, p162. 19 Macalister, Lebor Gabála Érenn Book V, 1956, p35. 20 Macalister, Lebor Gabála Érenn Book V, 1956, p53. 21 Ó hÓgaín, The Lore of Ireland: An Encyclopedia of Myth, Legend and Romance, 2006, p30. 22 Dames, Mythic Ireland, 1992, p217. 23 Ó hÓgaín, The Lore of Ireland: An Encyclopedia of Myth, Legend and Romance, 2006, p38. 24 Macalister, Lebor Gabála Érenn Book IV, 1941, p157. 25 Ó hÓgaín, The Lore of Ireland: An Encyclopedia of Myth, Legend and Romance, 2006, p37. 26 Logan, The Old Gods: The Facts about Irish Fairies, 1981, p7. 27 Koch, Encyclopedia of Celtic Culture, 2005, p1695. 28 O’ Rahilly, Early Irish History and Mythology, 1946, p38. 29 Ó hÓgaín, The Lore of Ireland: An Encyclopedia of Myth, Legend and Romance, 2006, p313. 30 Ó Crualaoich, The Book of the Cailleach, 2003, p82. 31 Ó Crualaoich, The Book of the Cailleach, 2003, plate 3. 32 Ó Crualaoich, The Book of the Cailleach, 2003, p51. 33 Ó hÓgaín, The Lore of Ireland: An Encyclopedia of Myth, Legend and Romance, 2006, p58. 34 Ó hÓgaín, The Lore of Ireland: An Encyclopedia of Myth, Legend and Romance, 2006, p119. 35 Byrne, Irish Kings and High-Kings, 2001, p166-167. 36 MacNeill, The Festival of Lughnasa, 1962, p160-161. 37 Wood-Martin, Traces of the Elder Faiths of Ireland Volume I, 1902, p362. 38 Ó Crualaoich, The Book of the Cailleach, 2003, p100. 39 Ó Crualaoich, The Book of the Cailleach, 2003, p111-112. 40 Monaghan, The Red-Haired Girl From the Bog, 2003, p23. 41 Wood-Martin, Traces of the Elder Faiths of Ireland Volume I, 1902, p361. 42 Wood-Martin, Traces of the Elder Faiths of Ireland Volume I, 1902, p361. 43 Dooley and Roe, Tales of the Elders of Ireland, 1999, p116; Logan, The Old Gods: The Facts about Irish Fairies, 1981, p141. 44 Ibid; See also MacQuarrie, The Waves of Manannán, 1997, p228-229. 45 Wood-Martin, Traces of the Elder Faiths of Ireland Volume I, 1902, p371. 46 Lysaght, The Banshee: The Irish Supernatural Death Messenger, 1986, p196. 47 Ó hÓgaín, The Lore of Ireland: An Encyclopedia of Myth, Legend and Romance, 2006, p85-86. 48 Wood-Martin, Traces of the Elder Faiths of Ireland Volume I, 1902, p372. 49 Wood-Martin, Traces of the Elder Faiths of Ireland Volume I, 1902, p372. 50 Logan, The Old Gods: The Facts about Irish Fairies, 1981, p51-53. 51 Dooley and Roe, Tales of the Elders of Ireland, 1999, p14. 52 Ó hÓgaín, The Lore of Ireland: An Encyclopedia of Myth, Legend and Romance, 2006, p153. 53 Ó hÓgaín, The Lore of Ireland: An Encyclopedia of Myth, Legend and Romance, 2006, p153. 54 Ó hÓgaín, The Lore of Ireland: An Encyclopedia of Myth, Legend and Romance, 2006, p153. 55 Ó hÓgaín, The Lore of Ireland: An Encyclopedia of Myth, Legend and Romance, 2006, p168. 56 Ó hÓgaín, The Lore of Ireland: An Encyclopedia of Myth, Legend and Romance, 2006, p179. 57 MacNeill, The Festival of Lughnasa, 1962, p201-206. 58 Logan, The Old Gods: The Facts about Irish Fairies, 1981, p34-35; Ó Duinn, Where Three Streams Meet: Celtic Spirituality, 2000, p67. 59 Ó hÓgaín, The Lore of Ireland: An Encyclopedia of Myth, Legend and Romance, 2006, p179. 60 Macalister, Lebor Gabála Érenn Book V, 1956, p65. 61 Macalister, Lebor Gabála Érenn Book V, 1956, p31. 62 Ó hÓgaín, The Lore of Ireland: An Encyclopedia of Myth, Legend and Romance, 2006, p179-180. 63 MacNeill, The Festival of Lughnasa, 1962, p284. 64 Logan, The Old Gods: The Facts about Irish Fairies, 1981, p40-41. 65 Macalister, Lebor Gabála Érenn Book V, 1956, p31. 66 Dooley and Roe, Tales of the Elders of Ireland, 1999, p33. 67 Macalister, Lebor Gabála Érenn Book V, 1956, p35. 68 Macalister, Lebor Gabála Érenn Book V, 1956, p53. 69 Ó hÓgaín, The Lore of Ireland: An Encyclopedia of Myth, Legend and Romance, 2006, p234. 70 Logan, The Old Gods: The Facts about Irish Fairies, 1981, p27-29. 71 Macalister, Lebor Gabála Érenn Book V, 1956, p35. 72 Ó hÓgaín, The Lore of Ireland: An Encyclopedia of Myth, Legend and Romance, 2006, p278. 73 O’ Rahilly, Early Irish History and Mythology, 1946, p290; Logan, The Old Gods: The Facts about Irish Fairies, 1981, p56. 74 Dooley and Roe, Tales of the Elders of Ireland, 1999, p239. 75 Ó hÓgaín, The Lore of Ireland: An Encyclopedia of Myth, Legend and Romance, 2006, p314. 76 Ó hÓgaín, The Lore of Ireland: An Encyclopedia of Myth, Legend and Romance, 2006, p331. 77 Stokes, ‘Coir Anmann: The Fitness of Names’, in Irische Texte III, 1897, p357. 78 Macalister, Lebor Gabála Érenn Book IV, 1941, p153. 79 Macalister, Lebor Gabála Érenn Book IV, 1941, p187, although a different genealogy/scenario is given elsewhere (p193), with Oirbsen being suggested as Manannán’s son. 80 Ó hÓgaín, The Lore of Ireland: An Encyclopedia of Myth, Legend and Romance, 2006, p331. 81 Dooley and Roe, Tales of the Elders of Ireland, 1999, p117. 82 Macalister, Lebor Gabála Érenn Book IV, 1941, p72-73. 83 Monaghan, The Red-Haired Girl From the Bog, 2003, p82. 84 Macalister, Lebor Gabála Érenn Book V, 1956, p63. 85 Byrne, Irish Kings and High-Kings, 2001, p51. 86 Monaghan, The Red-Haired Girl From the Bog, 2003, p101. 87 Ó hÓgaín, The Lore of Ireland: An Encyclopedia of Myth, Legend and Romance, 2006, p359. 88 Macalister, Lebor Gabála Érenn Book IV, 1941, p193. 89 MacNeill, The Festival of Lughnasa, 1962, p172. 90 Macalister, Lebor Gabála Érenn Book IV, 1941, p237. 91 Ó hÓgaín, The Lore of Ireland: An Encyclopedia of Myth, Legend and Romance, 2006, p386. 92 Dooley and Roe, Tales of the Elders of Ireland, 1999, p225. 93 Dooley and Roe, Tales of the Elders of Ireland, 1999, p39-40. 94 Dames, Mythic Ireland, 1992, p227. 95 Macalister, Lebor Gabála Érenn Book IV, 1941, p149; p179. 96 Macalister, Lebor Gabála Érenn Book IV, 1941, p137; cf p341. 97 MacQuarrie, The Waves of Manannán, 1997, p219. 98 For an excerpt, see here. 99 MacNeill, The Festival of Lughnasa, 1962, p216. 100 Logan, The Old Gods: The Facts about Irish Fairies, 1981, p56.